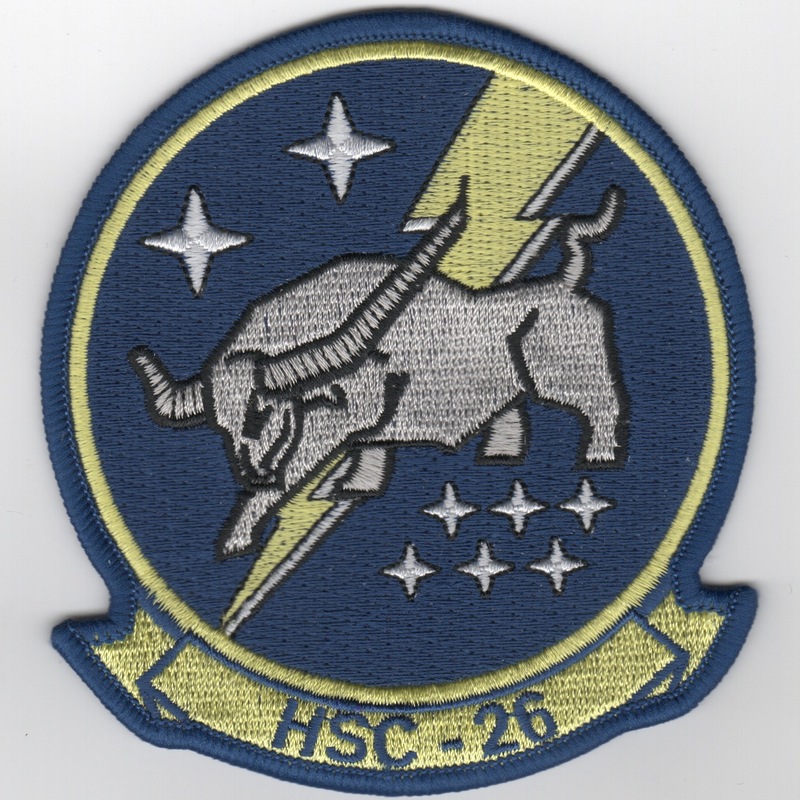 This is the dark blue/yellow version of the squadron patch for HSC-26. It features a bull on top of a lightning bolt. This patch does not come with velcro attached. 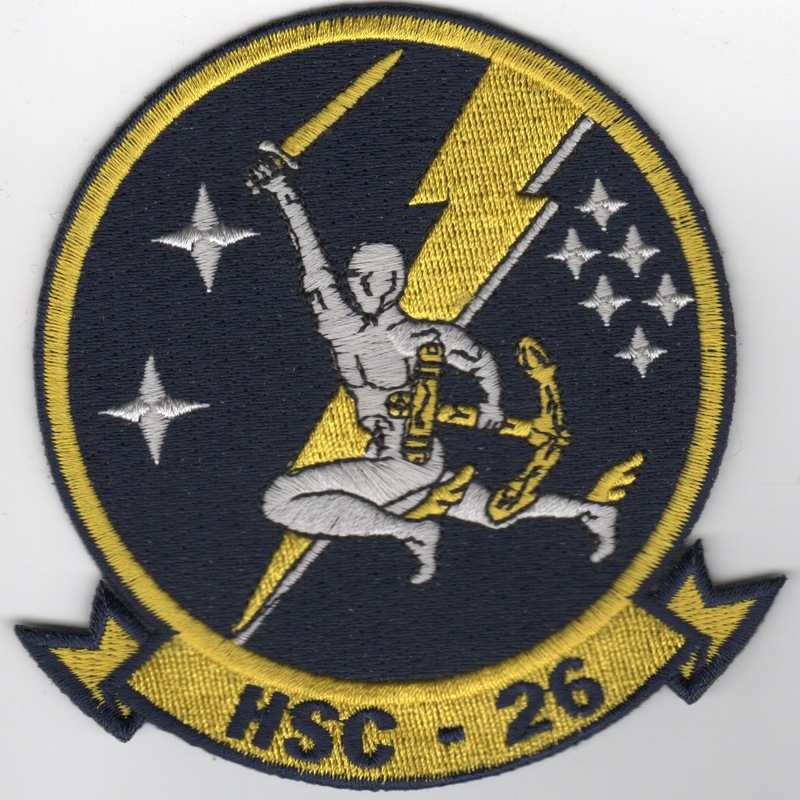 This is the dark blue/yellow version of the squadron patch for HSC-26. It features a man holding an anchor on top of a lightning bolt. This patch does not come with velcro attached. 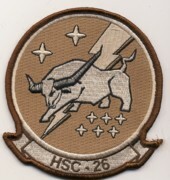 This is the desert version of the squadron patch for HSC-26. It features a bull on top of a lightning bolt. 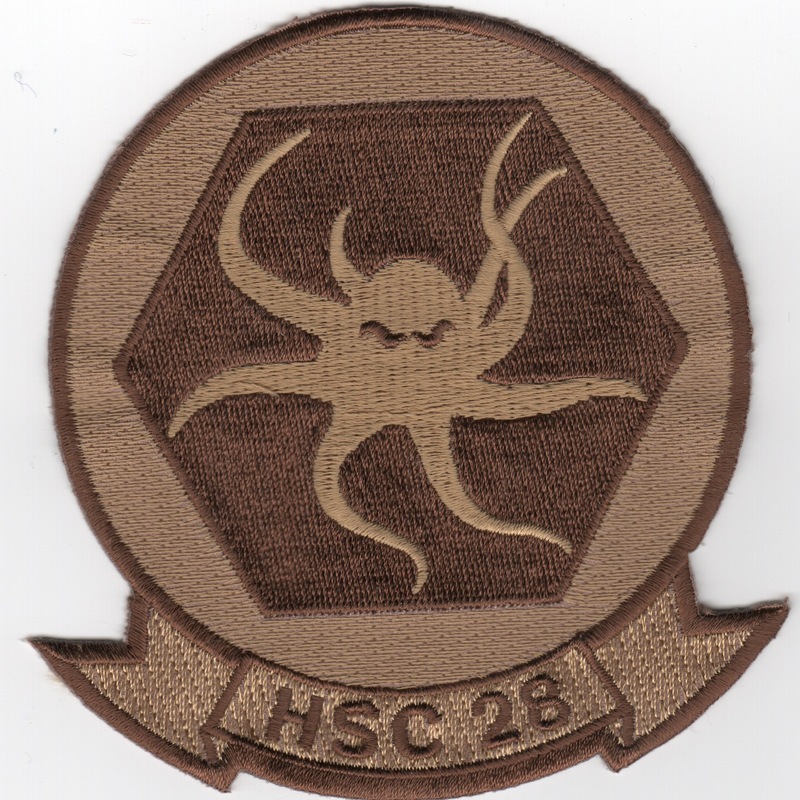 This is the subdued version of the squadron patch for HSC-26. It features a bull on top of a lightning bolt. This is the blue/color version of the Det-1 patch from the HSC-26 guys that states "Desert Hawks" and does not come with velcro already attached. This is the desert version of the Det-1 patch from the HSC-26 guys that states "Desert Hawks". 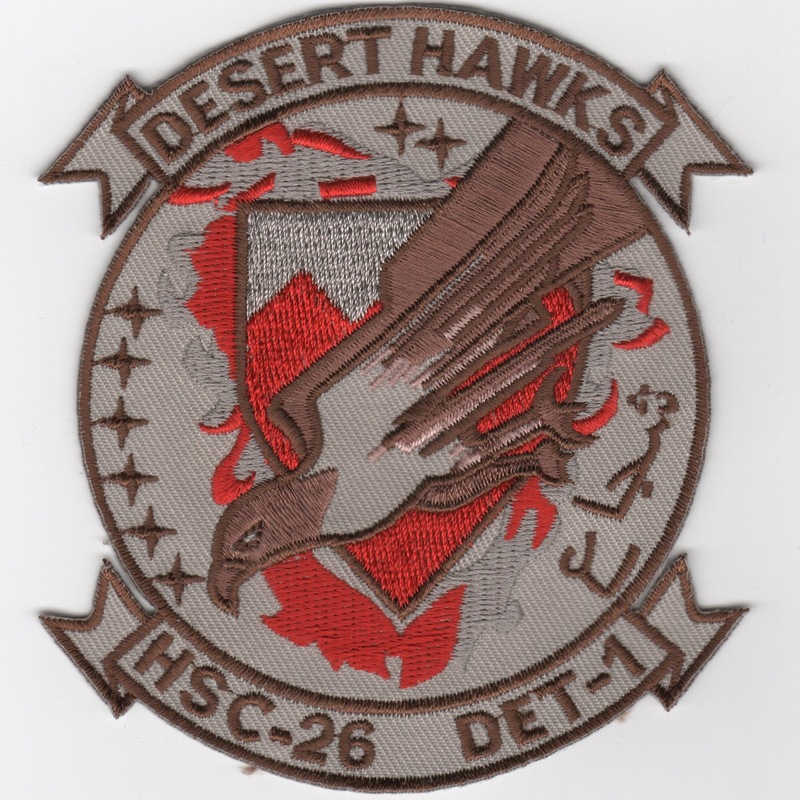 This is the desert version of the Det-1 patch from the HSC-26 guys that states "Desert Hawks". This patch has red thread on it, and does not come with velcro already attached. This is the desert version of the Det-1 patch from the HSC-26 guys that states "2PS Mafia" along the bottom. This patch does not have velcro attached. 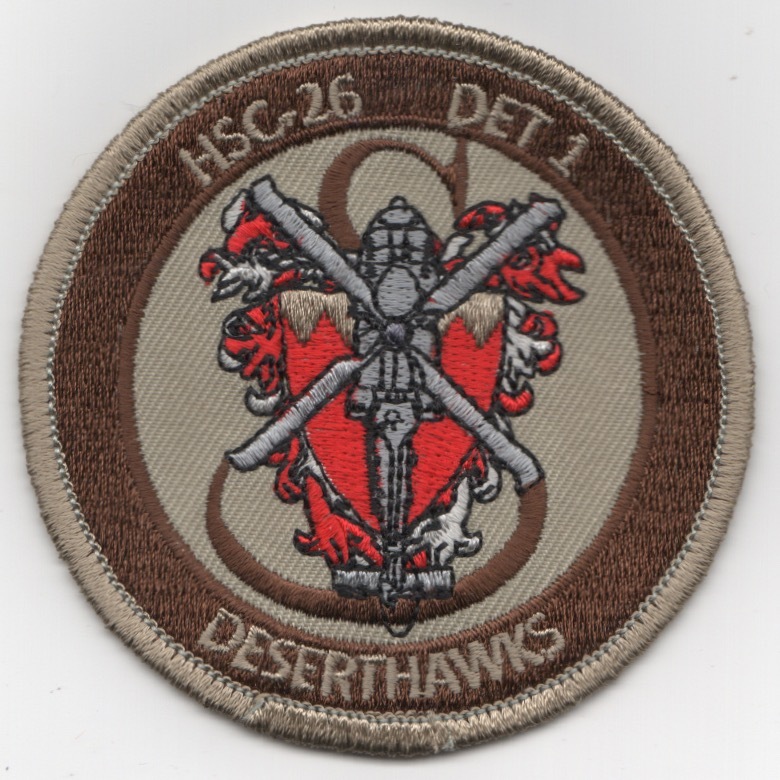 (Obtained from their supplier): This is the desert version of the HSC-26 Det-1 patch that says "DESERTHAWKS" along the bottom with a family "crest" (it looks like mine!) and the "S" underneath. This patch does not have velcro attached. This is the desert version of the Det-2 patch from the HSC-26 guys that states "EURO TRIP '05" while aboard the USS SAIPAN. 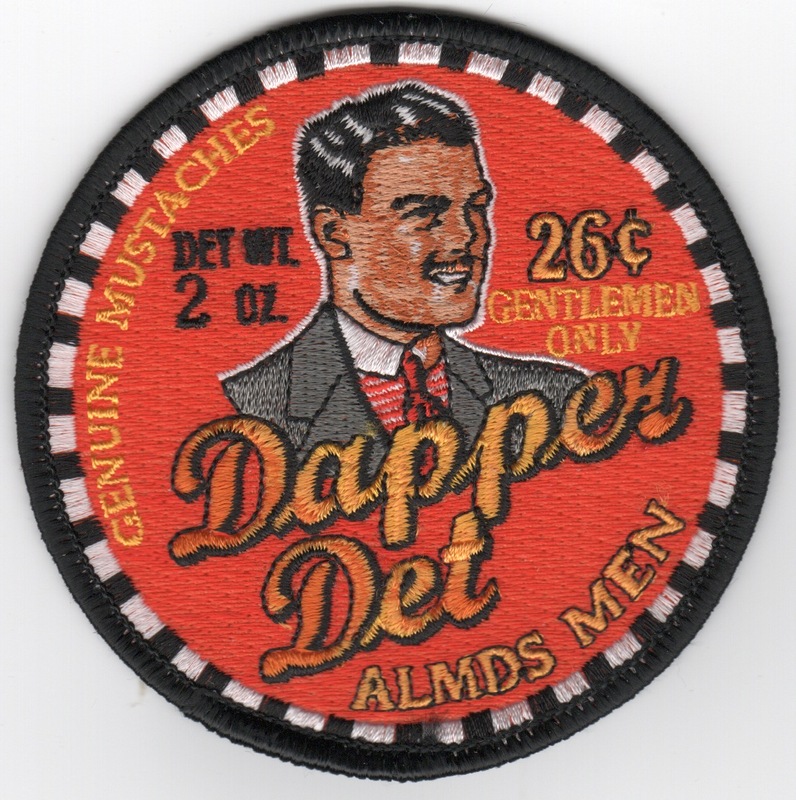 This is HSC-26 DET-2 "DAPPER DET" patch showing the logo from that "hair gel" made even more famous from the movie, "O Brother, Where Art Thou?" This patch does not come with velcro attached. This is the orange-bordered version of the Det-2 patch. 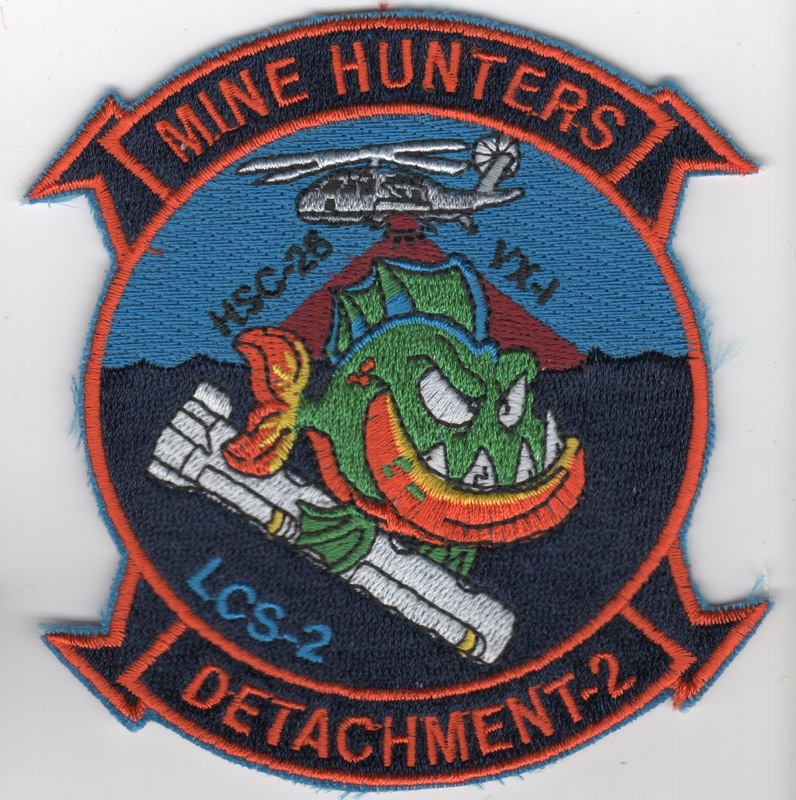 It says "MINEHUNTERS" across the top, and lists HSC-26, VX-1 and LCS-2 as participants in their exercise/det. This patch does not come with velcro attached. 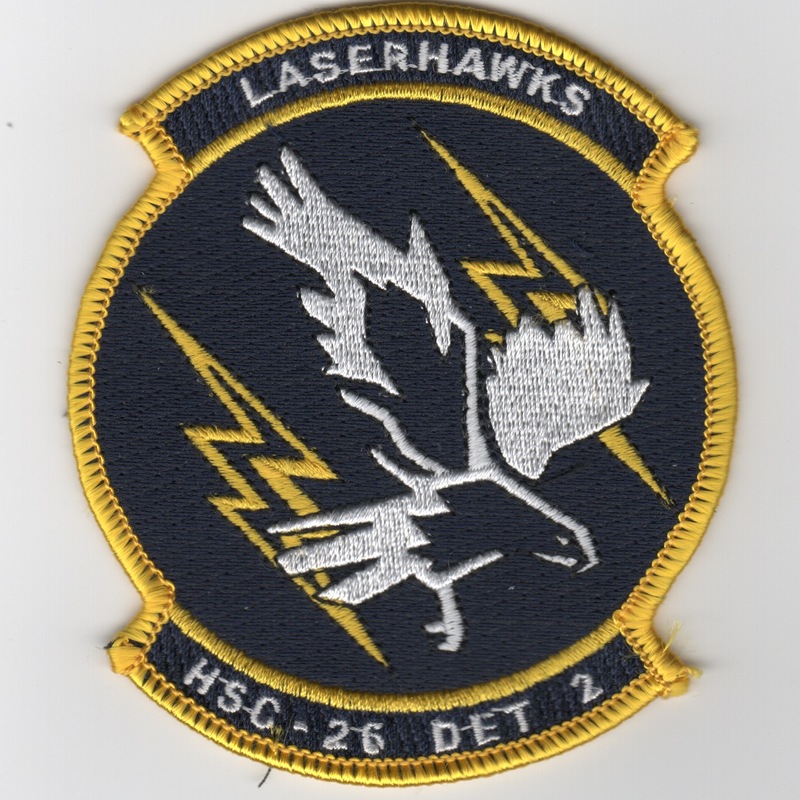 This is the Det-2 Patch for the HSC-26 "Laserhawks". 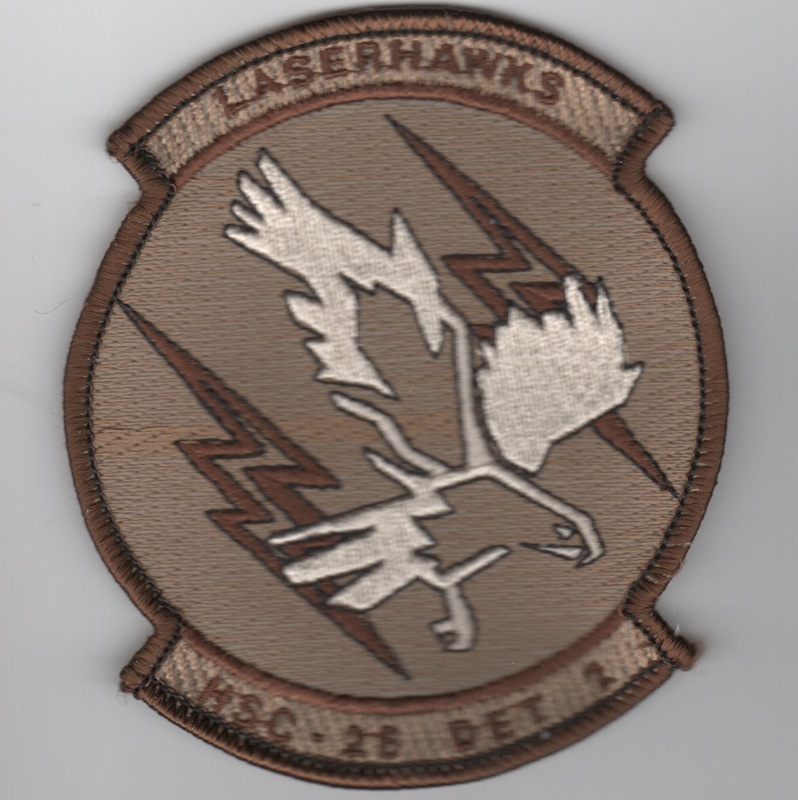 This is the desert version of the Det-2 Patch for the HSC-26 "Laserhawks". 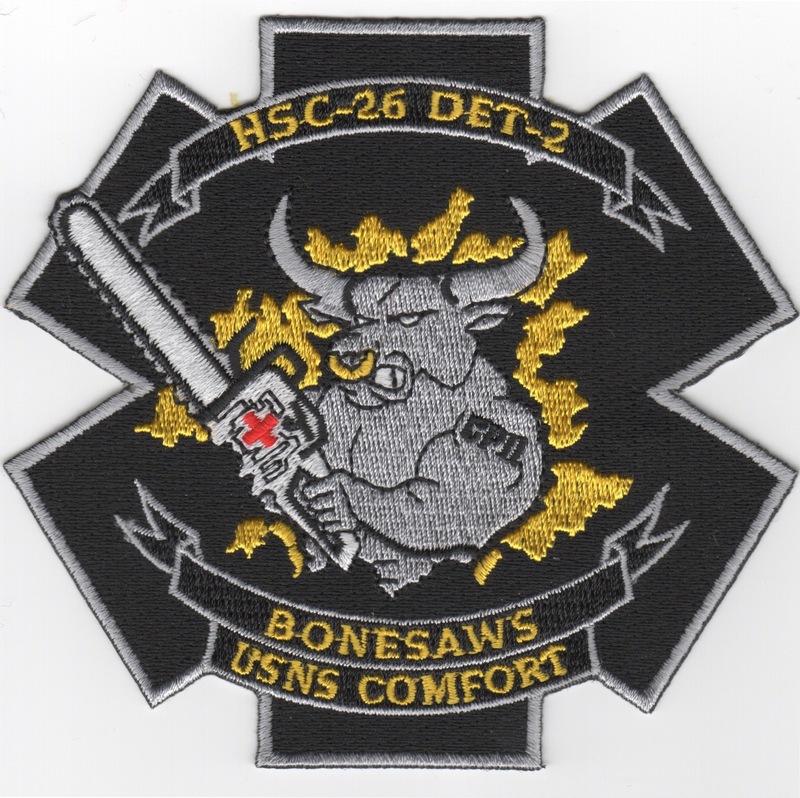 This is the Det-2 Patch for the HSC-26 "Bonesaws". 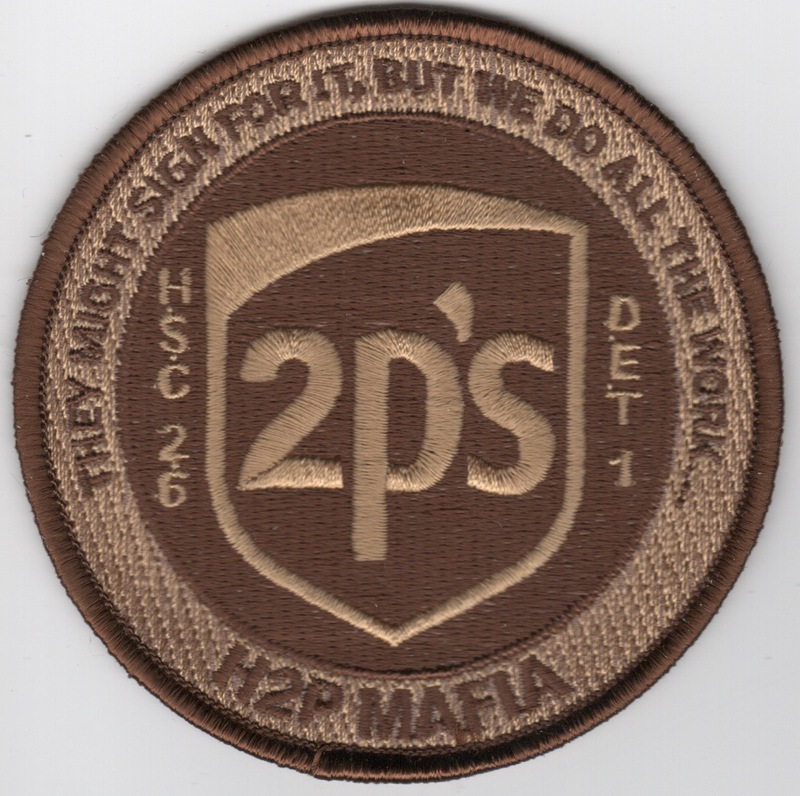 This is the Det-2 Patch for the HSC-26 "Bootleggers". It says "USNS MEDGAR EUERS" on the left side, and "HSC-26 T-AKE-13" on the right side with barrels of whiskey in the middle.....neat patch. This is the desert "TOUCAN" version of the Det-2 patch from the HSC-26 guys that states "EURO TRIP '05" while aboard the USS SAIPAN. 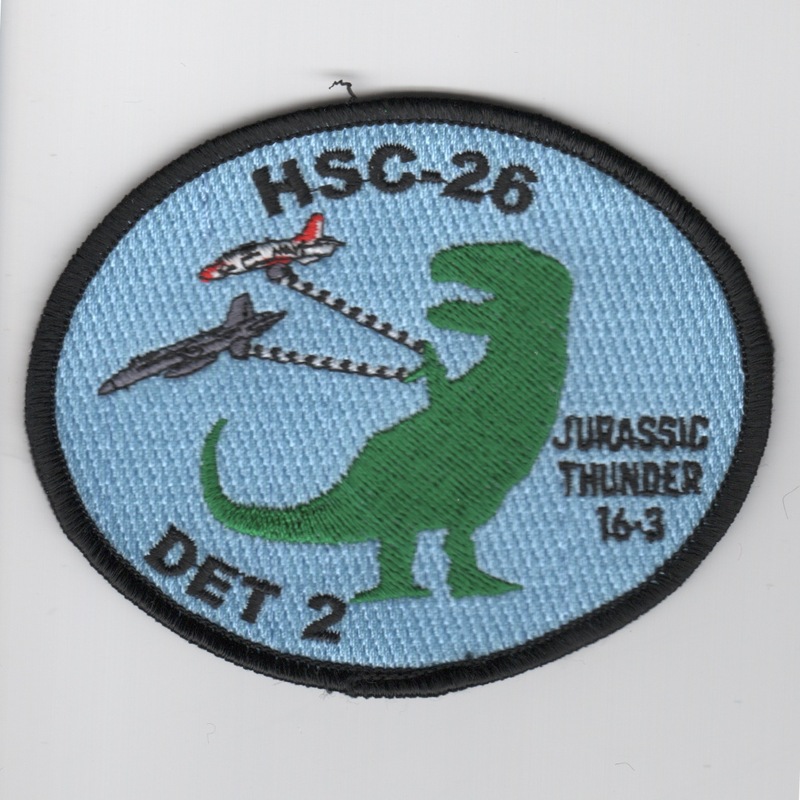 This is the 'dinosaur' version of the Det-2 patch. It says "JURASSIC THUNDER 16-3" on the right side, and shows a green T-Rex hooked by "tailhooks". This patch does not come with velcro attached. 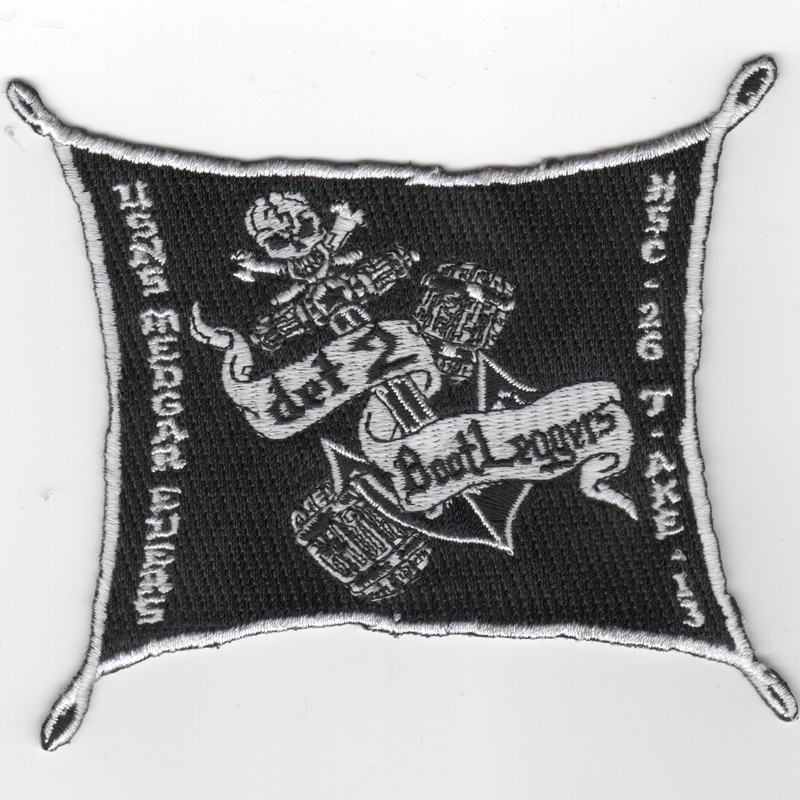 This is the color version of the "Hooligans" patch created for the HSC-26 Det-11 while they were aboard the USS SAIPAN. 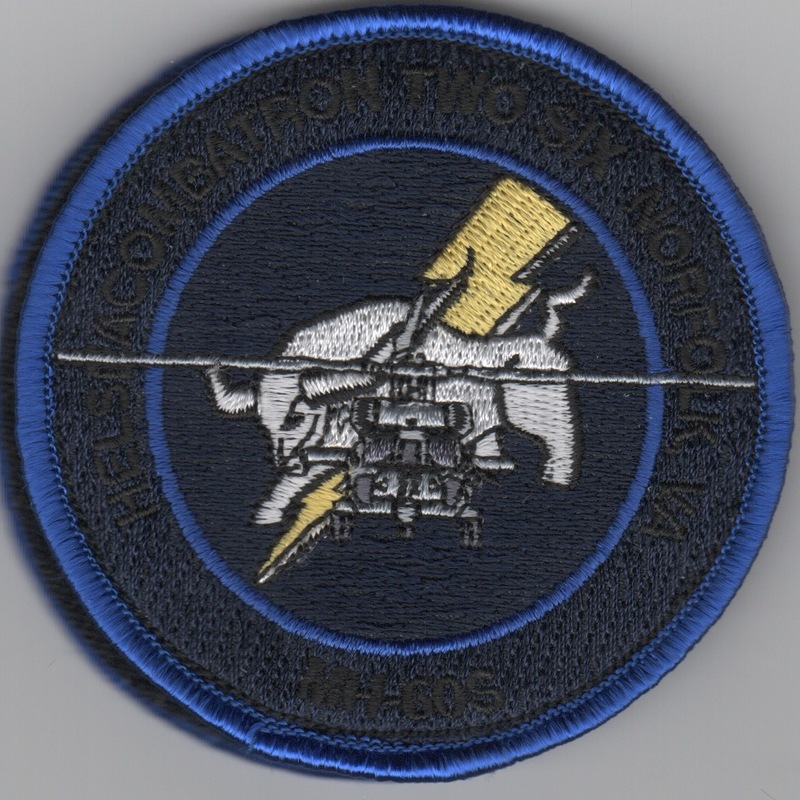 This is the desert version of the "Hooligans" patch created for the HSC-26 Det-11 while they were aboard the USS SAIPAN. 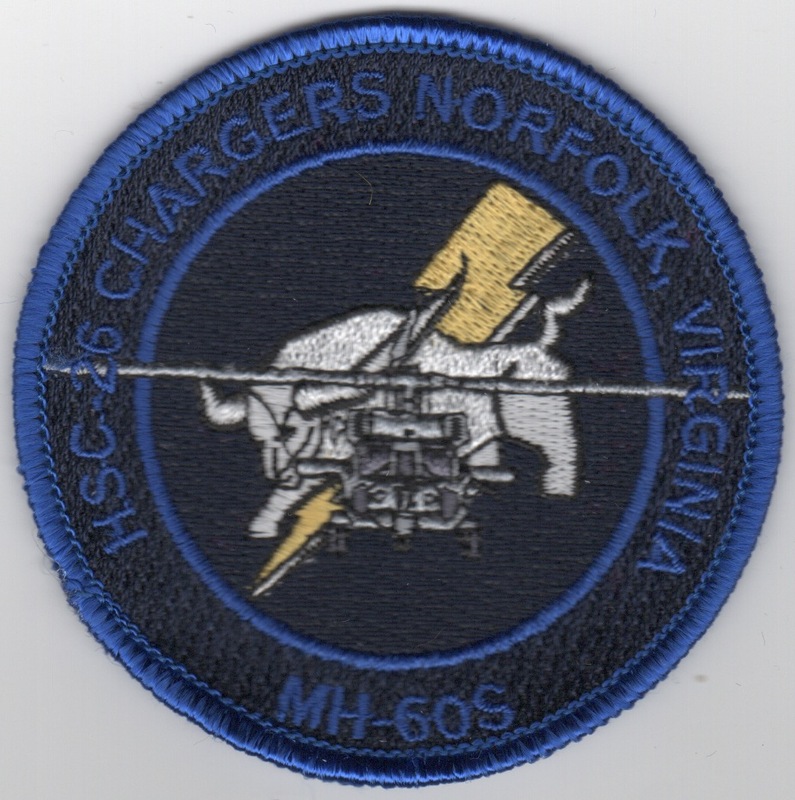 This version of the MH-60S patch is black with BLUE text and does not have velcro already attached. This version of the MH-60S patch is black with BLACK text and does have velcro already attached. 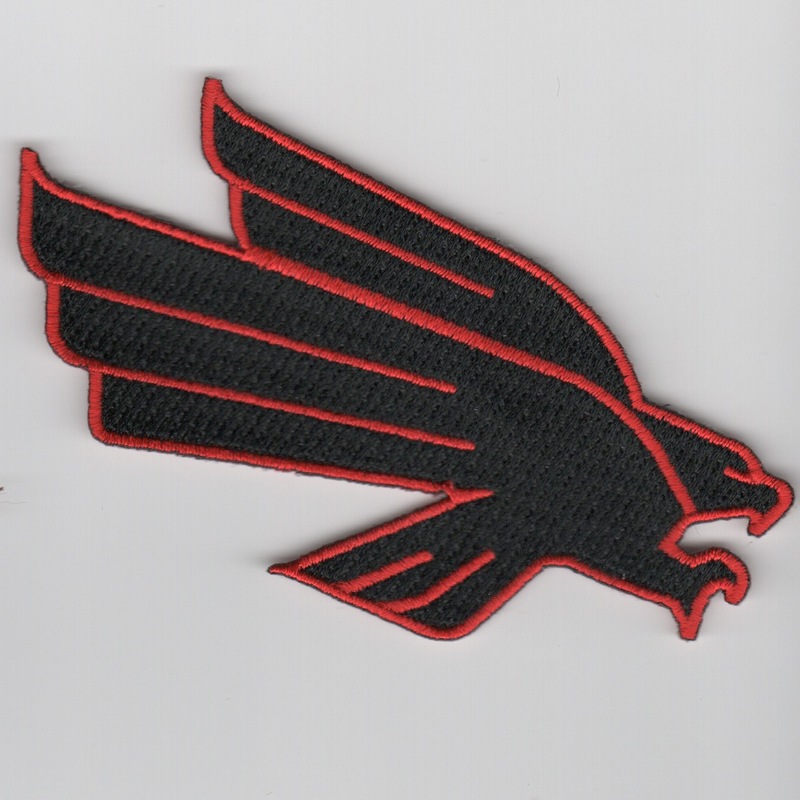 Another AV8RSTUFF creation: This patch, to me, looks like something from the Atlanta Falcons, but it's one of their patches created for the HSC-26 'Chargers' that fly out of NAS Norfolk, VA. This patch does not have velcro attached. 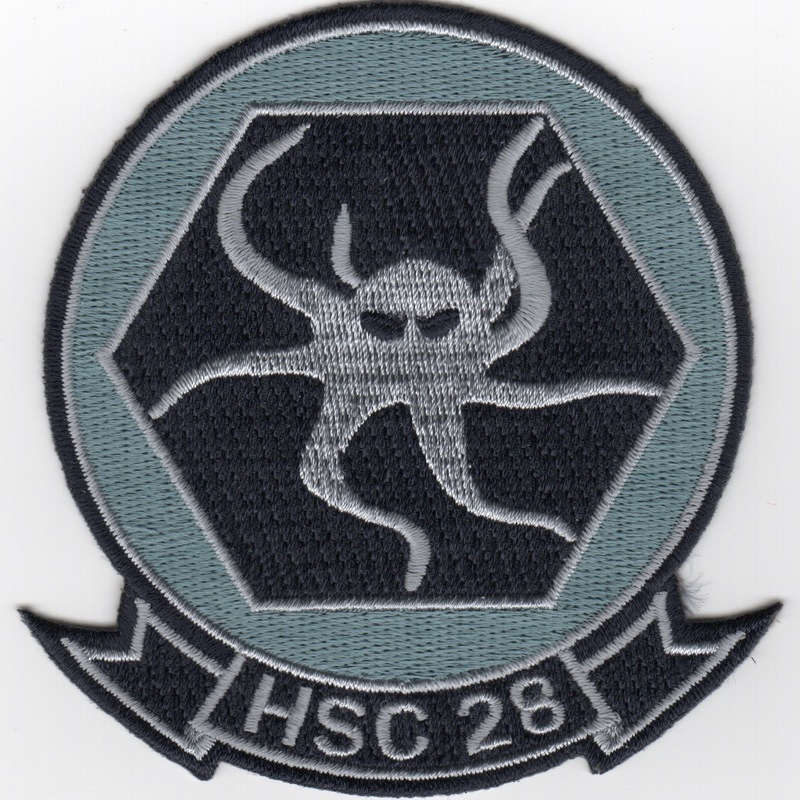 This is the medium-sized, blue version of the squadron patch for HSC-28. Helicopter Combat Support Squadron (HC) 8 was redesignated, in early 2005 as�Helicopter Sea Combat Squadron 28 (HSC-28�The �Dragon Whales!�)�as part of a merger of the HC and helicopter anti-submarine (HS) communities. The change came as a result of the introduction of the MH-60S �Knighthawk�, replacing the CH-46D �Sea Knight�, UH-3H Sea King and the SH-60F Seahawk, and the future introduction of the MH-60R Seahawk, which is replacing the SH-60B Seahawk. The�Dragon Whales�of HC-8�flew�the�CH-46�Sea Knight��and performed search and rescue and vertical replenishment in support of the Atlantic Fleet. HC-8 also operated the Atlantic Fleet Helicopter Operations School (HELIOPS) providing Landing Signalman Enlisted (LSE), Helicopter Instrument Ground School (HIGS), Helicopter Control Officer (HCO), and night vision goggles training. �HSC-28 now flies solely the MH-60S �Knighthawk��to perform Search and Rescue (SAR) and vertical replenishment (VERTREP) as well as, with the implementation of the armed helo upgrade, the ability to support Special Operation Forces (SOF), Anti-Surface Warfare (ASUW), and Personnel Recovery (PR) mission areas�in support of the Atlantic Fleet. 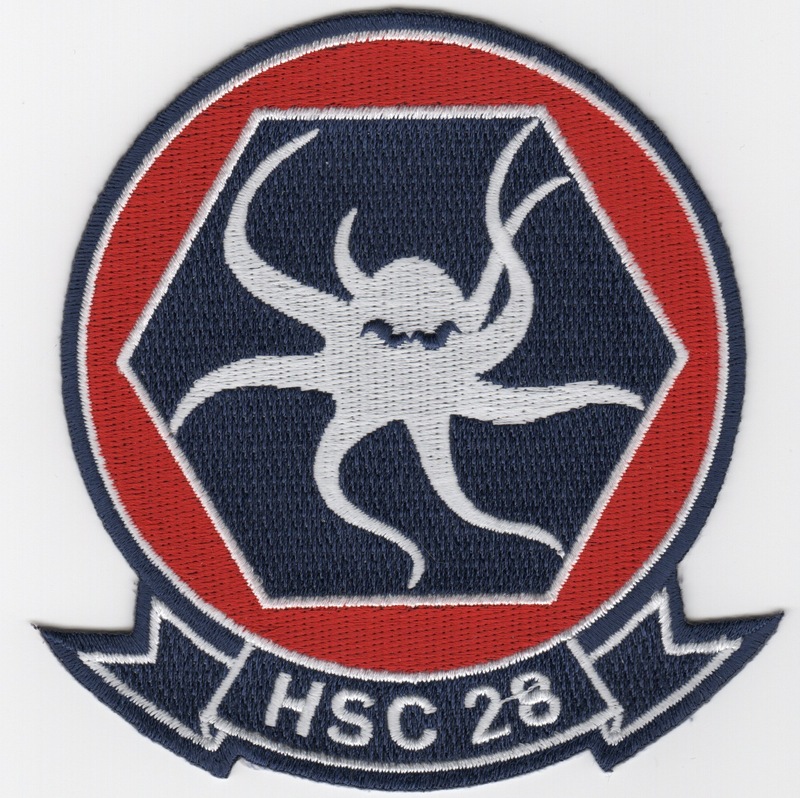 This is the regular-sized, red/blue version of the squadron patch for HSC-28. Helicopter Combat Support Squadron (HC) 8 was redesignated, in early 2005 as�Helicopter Sea Combat Squadron 28 (HSC-28�The �Dragon Whales!�)�as part of a merger of the HC and helicopter anti-submarine (HS) communities. The change came as a result of the introduction of the MH-60S �Knighthawk�, replacing the CH-46D �Sea Knight�, UH-3H Sea King and the SH-60F Seahawk, and the future introduction of the MH-60R Seahawk, which is replacing the SH-60B Seahawk. The�Dragon Whales�of HC-8�flew�the�CH-46�Sea Knight��and performed search and rescue and vertical replenishment in support of the Atlantic Fleet. HC-8 also operated the Atlantic Fleet Helicopter Operations School (HELIOPS) providing Landing Signalman Enlisted (LSE), Helicopter Instrument Ground School (HIGS), Helicopter Control Officer (HCO), and night vision goggles training. �HSC-28 now flies solely the MH-60S �Knighthawk��to perform Search and Rescue (SAR) and vertical replenishment (VERTREP) as well as, with the implementation of the armed helo upgrade, the ability to support Special Operation Forces (SOF), Anti-Surface Warfare (ASUW), and Personnel Recovery (PR) mission areas�in support of the Atlantic Fleet. 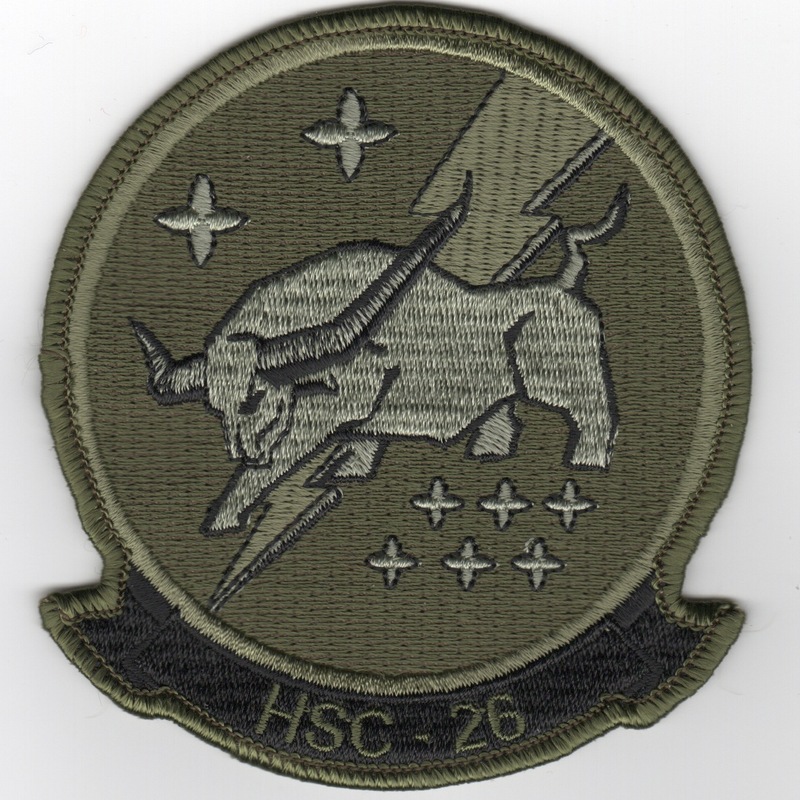 This is the regular-sized, desert version of the squadron patch for HSC-28. 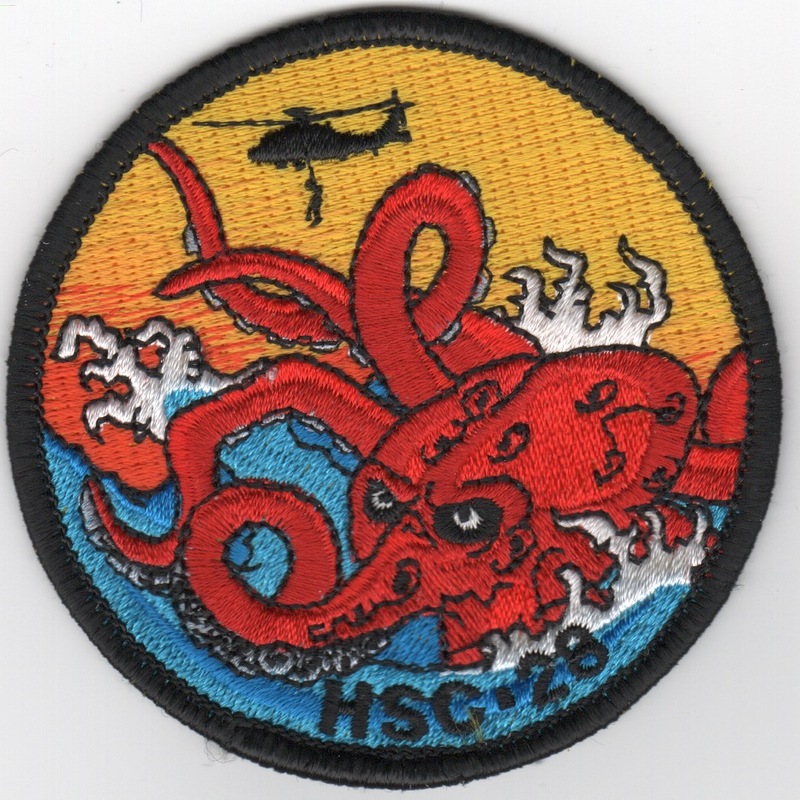 Helicopter Combat Support Squadron (HC) 8 was redesignated, in early 2005 as�Helicopter Sea Combat Squadron 28 (HSC-28�The �Dragon Whales!�)�as part of a merger of the HC and helicopter anti-submarine (HS) communities. The change came as a result of the introduction of the MH-60S �Knighthawk�, replacing the CH-46D �Sea Knight�, UH-3H Sea King and the SH-60F Seahawk, and the future introduction of the MH-60R Seahawk, which is replacing the SH-60B Seahawk. The�Dragon Whales�of HC-8�flew�the�CH-46�Sea Knight��and performed search and rescue and vertical replenishment in support of the Atlantic Fleet. HC-8 also operated the Atlantic Fleet Helicopter Operations School (HELIOPS) providing Landing Signalman Enlisted (LSE), Helicopter Instrument Ground School (HIGS), Helicopter Control Officer (HCO), and night vision goggles training. �HSC-28 now flies solely the MH-60S �Knighthawk��to perform Search and Rescue (SAR) and vertical replenishment (VERTREP) as well as, with the implementation of the armed helo upgrade, the ability to support Special Operation Forces (SOF), Anti-Surface Warfare (ASUW), and Personnel Recovery (PR) mission areas�in support of the Atlantic Fleet. 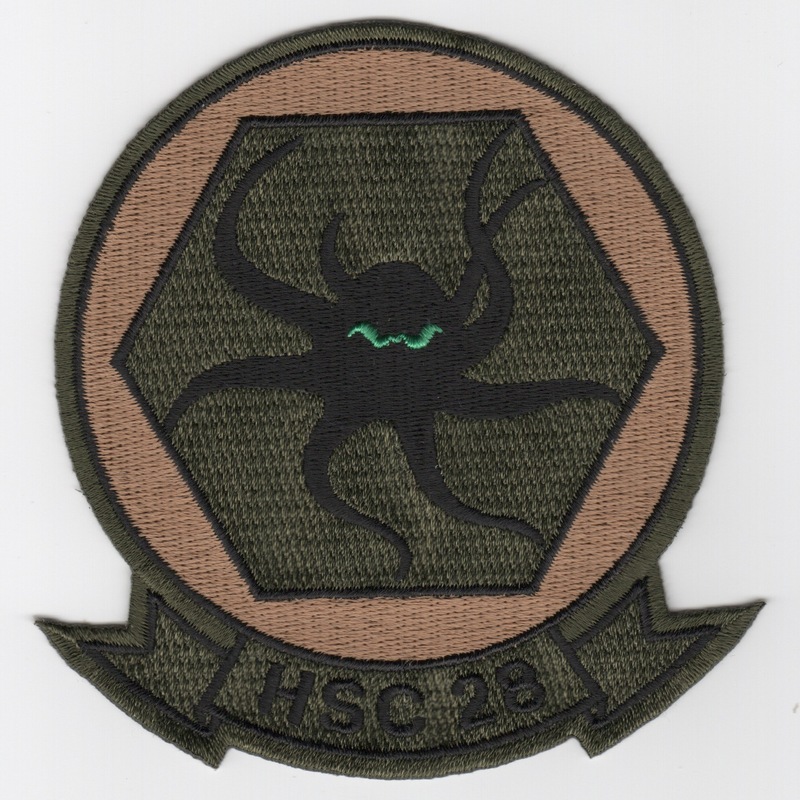 This is the regular-sized, subdued-version of the squadron patch for HSC-28. Helicopter Combat Support Squadron (HC) 8 was redesignated, in early 2005 as�Helicopter Sea Combat Squadron 28 (HSC-28�The �Dragon Whales!�)�as part of a merger of the HC and helicopter anti-submarine (HS) communities. The change came as a result of the introduction of the MH-60S �Knighthawk�, replacing the CH-46D �Sea Knight�, UH-3H Sea King and the SH-60F Seahawk, and the future introduction of the MH-60R Seahawk, which is replacing the SH-60B Seahawk. The�Dragon Whales�of HC-8�flew�the�CH-46�Sea Knight��and performed search and rescue and vertical replenishment in support of the Atlantic Fleet. HC-8 also operated the Atlantic Fleet Helicopter Operations School (HELIOPS) providing Landing Signalman Enlisted (LSE), Helicopter Instrument Ground School (HIGS), Helicopter Control Officer (HCO), and night vision goggles training. �HSC-28 now flies solely the MH-60S �Knighthawk��to perform Search and Rescue (SAR) and vertical replenishment (VERTREP) as well as, with the implementation of the armed helo upgrade, the ability to support Special Operation Forces (SOF), Anti-Surface Warfare (ASUW), and Personnel Recovery (PR) mission areas�in support of the Atlantic Fleet. 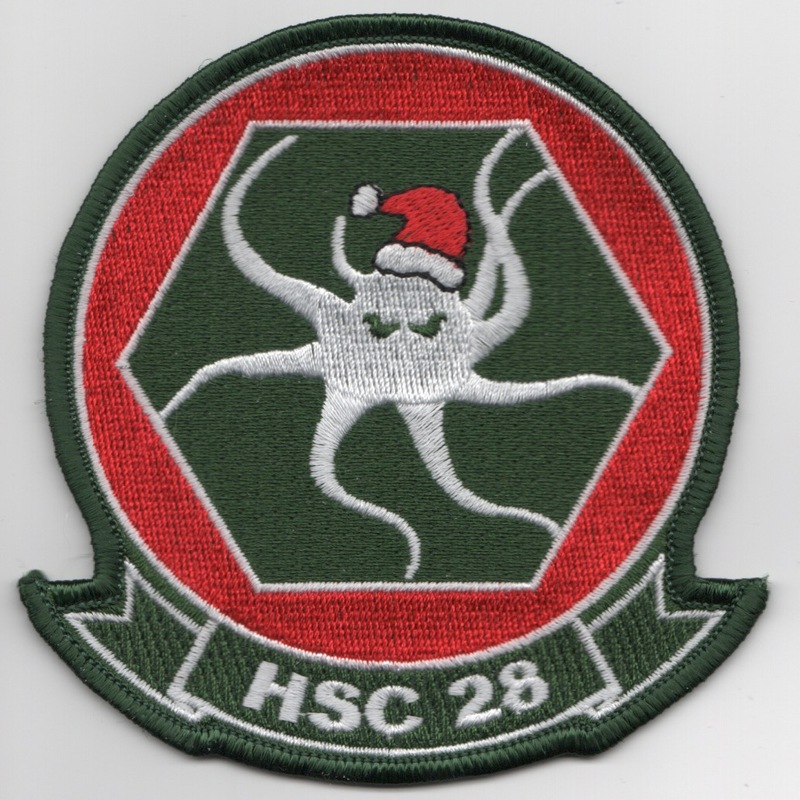 This is the green/red version of the HSC-28 Squadron patch that shows their mascot, the OCTOPUS, with a 'Santa' cap on. This patch does not come with velcro attached. This is the Jr. 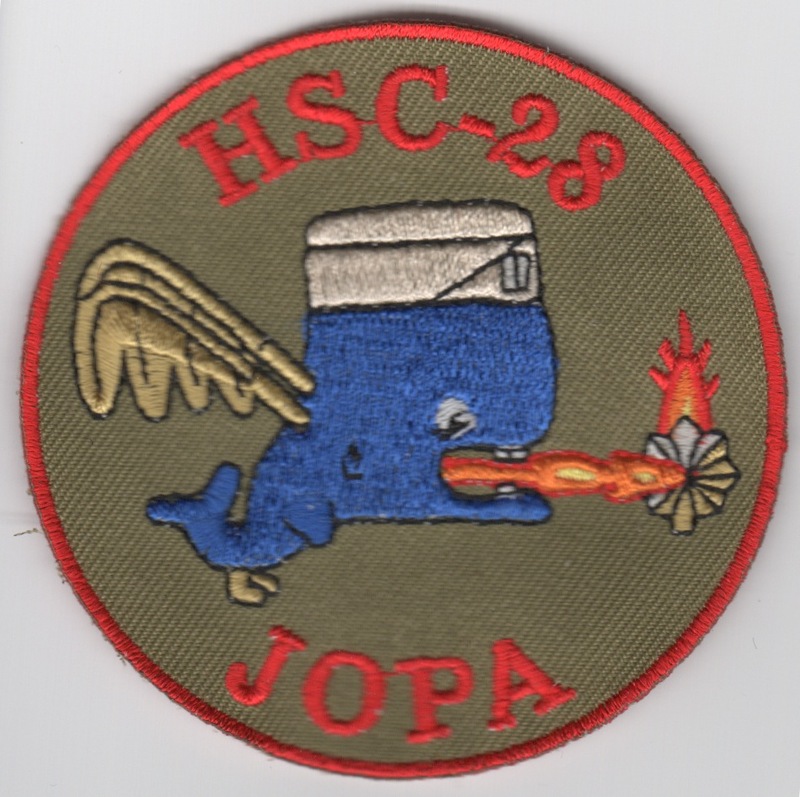 Officer Protection Agency (JOPA) patch created for the JO's of HSC-28 and shows a blue whale breathing fire on the "Oak Leaves" of the O-4/O-5 ranks. If I'm a betting man, the JO's were handed a decision by a Department Head that they didn't particularly like......This patch does not come with velcro attached. This is a detachment patch created for one of the dets for HSC-28, I just don't know which one. It depicts a 'red octopus" thrashing in the water being rescued by one of the "Rescue Swimmers" being lowered into the water from the helo (in the background). 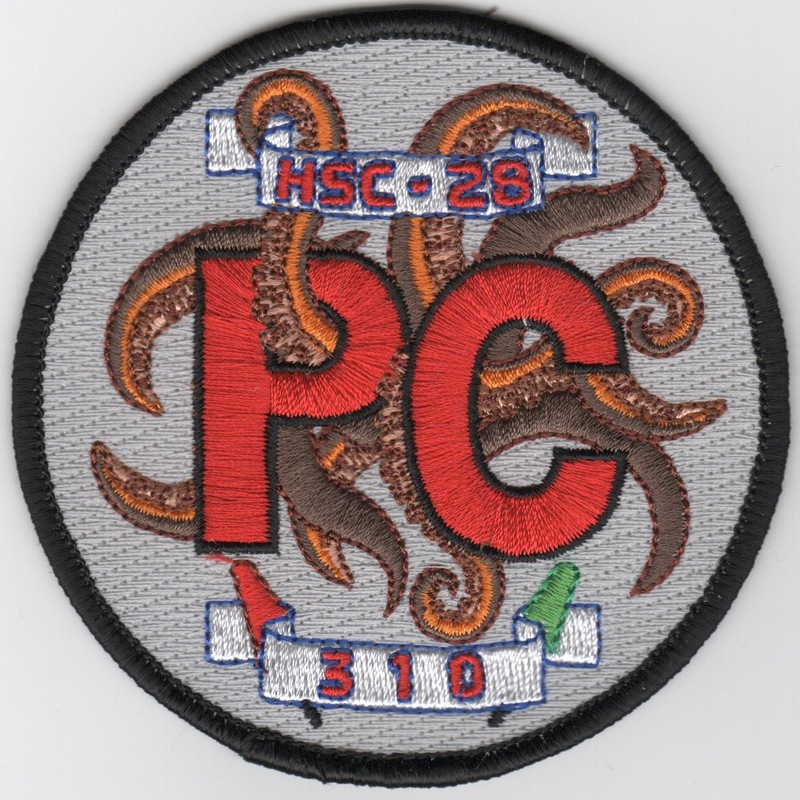 Another AV8RSTUFF creation: Apparently, I am the only one on the face of the Earth who doesn't know who "BOB ROSS" is, but HSC-28 has an inside joke/connection with this guy, so several patches are forthcoming on him. 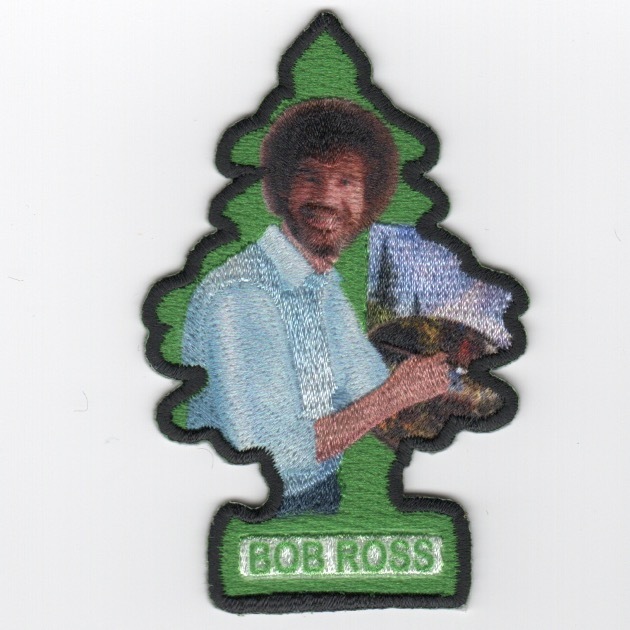 This is the first of several that depict him painting and is in the form of one of those "taxi-cab pine-tree air-fresheners"!! It doesn't have velcro and it doesn't smell like pine! !